This page firstly describes the the main musical roles that different types guitars have been designed to meet. Following that, it presents several of the main types of guitar that have been designed and built to fill these roles. Beginners are urged to take the time to gain an appreciation of the key differences and the purposes of the different types of guitar. A further summary of the characteristics of each guitar type, including the relative initial costs of purchase, can be can read in menu under Choosing guitars: making your choice of which type of guitar to study. 1) Solo playing : this involves playing complete musical compositions or arrangements on the guitar. This approach usually makes full use of the guitar’s ability to independently play more than one note at a time (i.e. its polyphonic capabilities). The guitar may be required to concurrently play both melody and harmony. 2) Accompaniment : accompaniment is the practice of providing musical support to the voice and/or other instruments. Accompaniment usually takes the form of harmony and chords and/or rhythmic support. An accompanist can be a solo artist accompanying her/his own singing or he/she can be a member of a group of musicians such as a rock band or an orchestra. A third musical role can also be said to be met by the guitar. It reflects the guitar's ability to perform as a melody instrument. The vast majority of musical instruments are not designed to produce more than one note at a time, thus, when they are played on their own they are melody instruments, incapable of producing harmony. The major exceptions to this are the true polyphonic instruments: i.e. the keyboards, the plucked-string family (includes the guitar), the non-tuned percussion instruments and some of the tuned percussion family e.g. the vibrophone. All guitars are capable of both harmony and melody playing, therefore their constructions do not generally reflect attempts to exploit melody playing over other considerations. Specialist exceptions to this observation do exist, such as pedal steel and slide or bottleneck guitars, both designed to exploit a unique melodic sonic effect. The well known practice of "taking a solo" within a band or orchestral context describes the practice of an instrumentalist, i.e. the "soloist", playing a melody (usually) whilst being allowed to stand out from the rest of the players. Such solos, being part of a wider group performance, do not meet the definition of solo instrumental performance in this article. It is important to note that the roles of solo performer and accompanist do not dictate the style of music performed, although musical style also has an important bearing upon the choice of instrument. A solo performance might as easily consist of a 1930s blues tune as of a baroque fugue. A guitar can be found in a role as an accompanist in a classical trio as well as in a jazz band. The nylon-string guitar, played using the fingers to pluck the strings, excels in the execution of solo music. The nylon string guitar and its playing technique has developed over six centuries and is known as the classical guitar. The description of this style of guitar as classical is a relatively recent development. Prior the twentieth century the classical guitar was simply known as 'the guitar' but later developments of alternative constructions required the adoption of a more specific designation. Classical is a term that recognizes the instrument's place as being the product of high culture and of being a design that has stood the test of time. Music of many styles and eras can be performed on the classical guitar, including the cutting edge music of the modern avant-garde. The classical guitar has a rich and deep sound capable of varied nuance, its playing technique has evolved to exploit this attribute as well as everything else that the unaided instrument can offer. Some describe classical guitar as akin to a small piano in its effect but with a far greater tonal palette. It is the most stylistically versatile of all the types of guitar. It can also be used for accompaniment in many styles of music. The flamenco guitar also has nylon strings and is a very close relative of the classical instrument both in its construction and in its playing technique. It has a brighter tone which enables it to be used as exciting rhythmic accompaniment to flamenco dance and voice. Both the classical and flamenco guitar are relatively lightly constructed, their soundboards are made just strong and stiff enough to withstand their string tensions and also to vibrate as strongly as possible when played. Their fingerboards are wider than most other guitars, this allows enough room for the fingers to clearly articulate complex music when required. 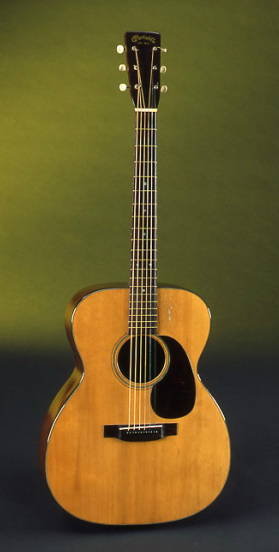 The acoustic steel string guitar, sometimes known as the flat-top acoustic or even as the folk guitar, is less frequently used in a solo capacity. Its construction presents the player with certain technical and musical difficulties if it is required to play solo arrangements. These difficulties arise because its design is primarily aimed toward accompaniment, as is described in the following section. However, its bright tone and its ability to produce distinctive effects, such as string bending, is enough to motivate some artists to overcome the difficulties and use it as a solo finger-style instrument, particularly when performing twentieth century musical styles from the USA. Some modern guitar makers are even responding to player demand and offering custom made steel string guitars with some features similar to the classical guitar, making its use in finger-style solo playing more accessible. 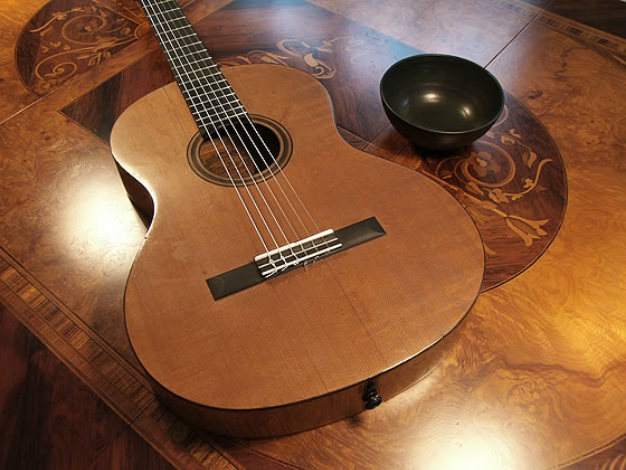 In contrast to the field of solo guitar music, which is dominated by the classical guitar, a range of instruments has evolved for use in various accompaniment situations. These situations fall broadly into two categories, acoustic and electric. The acoustic guitars most commonly used in the role of accompaniment are the nylon classical guitar and the steel string or flat-top acoustic guitar. The choice is highly dependent on musical style performed and is often also influenced by geographical and cultural context. The nylon string classical guitar has long remained the the instrument of choice for many cultures, notably Latin cultures and those of South America, where it is used both for popular styles and for classical music. The steel string acoustic guitar is the instrument of first choice for many folk musicians and popular performers who often require relatively simple or percussive chordal accompaniment. It is found particularly in North American and Western European popular, rock, jazz and folk music cultures. It is very seldom used for playing the classical repertoire. It has a brighter sound due primarily to the choice of steel as the string material (steel or other metal alloy). It has a more robust construction and a steel reinforced neck to withstand its higher string tensions. It has different dimensions in key areas such as having a fingerboard that is both convex in profile and narrower in width. It does not usually have a slotted headstock, instead the strings are attached to the tuning gears by being wound around metal string posts. The use of a pick, or plectrum, rather than fingers, is the commonly preferred means of sounding the strings. Although its construction has roots in the European tradition and in makers such as CF Martin, the modern steel string instrument has largely developed in the USA during the twentieth century. It is constructed in differing models and sizes, all variations on a theme - dreadnought, parlour, concert models being the names of but a few. 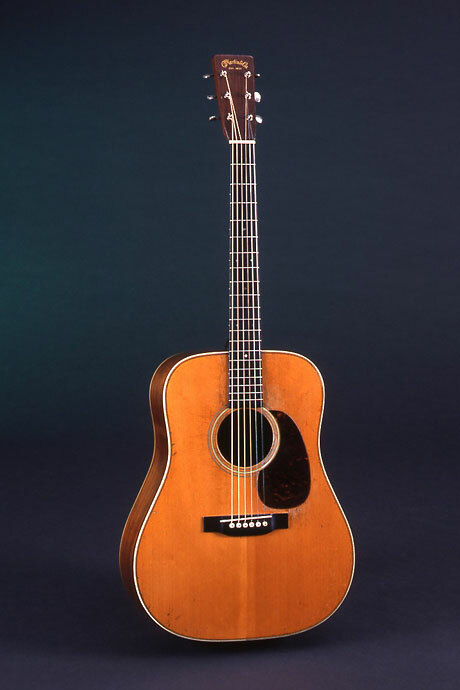 Some very specialized forms exist, such as the arch-top acoustic guitar which was designed to meet a demand for higher playing volumes and was adopted by players in many early twentieth century North American dance bands. 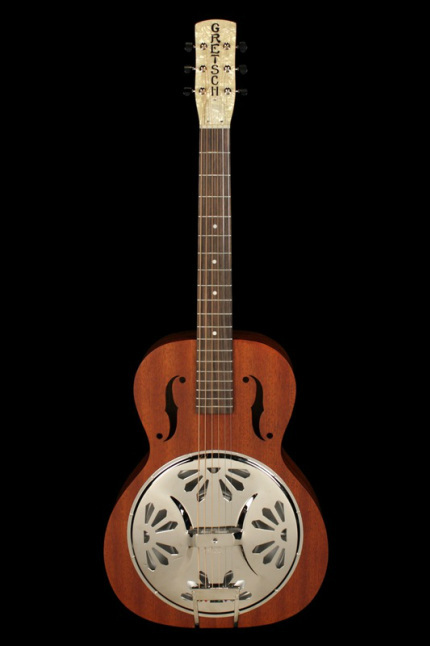 The distinctive looking and sounding resonator guitar arose from another attempt to generate higher volume from an acoustic instrument. These instruments developed in the 1930s from the steel string acoustic guitars used in dance bands and in the Big Band era in the USA. They are also strung with steel or metal alloy strings. The call was for more volume, delivered electronically. 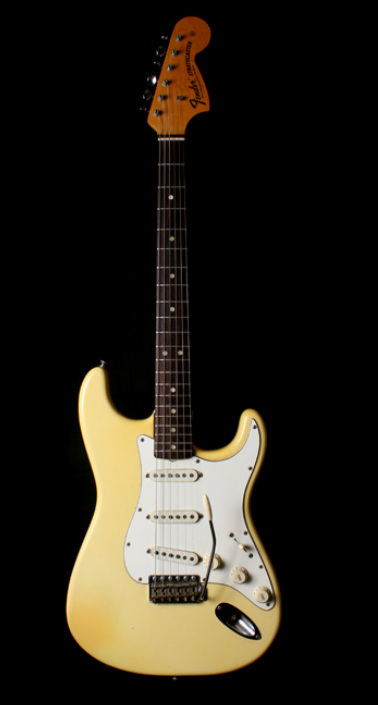 Some modern electric guitars retain the shape and general construction of their progenitors, such as the arch top jazz guitar, others arise from the later invention of the solid body electric guitar which enabled the instrument to be produced in radical new designs and deliver higher volumes without audio feedback. 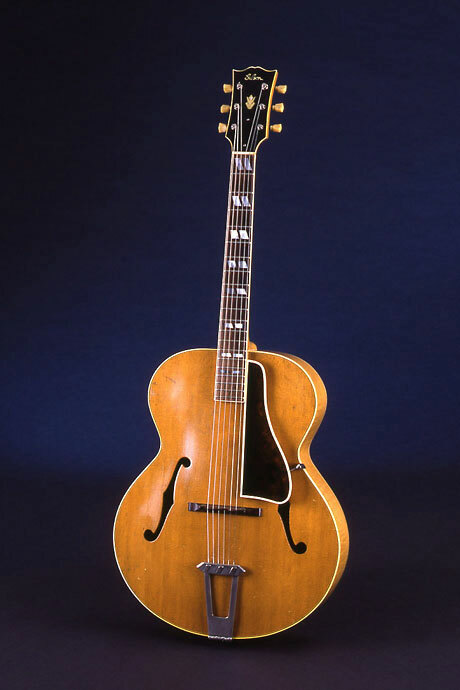 The solid-body guitar was elevated into popular iconic status by both the Fender and Gibson companies in the 1950s. Electric guitars were adopted quickly by musicians in many fields of popular music. In particular, rock music wouldn't exist, or be as much fun, without the invention of the solid body electric guitar. Electric guitars require an electronic amplifier in order to function as intended. The electric guitar usually assumes one of two functions within a musical group, that of providing rhythmic and harmonic accompaniment or that of playing a single melodic line of music, often it shares in both duties. The electric guitar is generally regarded as unsuitable for solo performance and it is overwhelmingly found only in group contexts. Its use remains notably and lamentably absent from the field of art music. It shares much of its playing technique, such as use of a plectrum, with the steel string acoustic guitar.